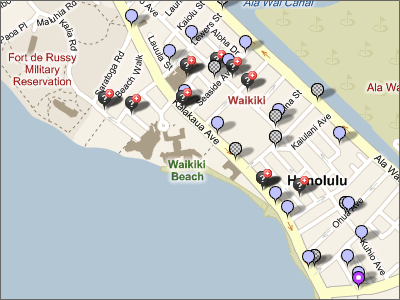 All those balloons you see on the Waikiki map represent crimes in my neighborhood. No, not the crimes featured on Hawaii Five-0. That's a different venue. As in, the crimes on Hawaii Five-0 are exclusively murder. The crimes marked on this map are mostly misdemeanors. Hawaii, here. Other parts of the USA, here. Good site - just saw it on the news this evening! Thanks for posting this. I'd better close my doors more often. I know neighbors have told me that there are burglaries. The nice thing is my neighbors have dogs that bark up a storm and there's a lot of retirees in my area who keep their eyes open for each other. Nate- I guess people in the neighborhood kinda know about the incidents but not how many. Kay- they better go check if something they recognize isn't being sold at the swap meet.